Ontologies are known to be suitable to represent business knowledge. However, in the Business Rules community the business models are usually represented using object models (OM). Many of the existing Business Rules Management Systems (BRMS) allow the Business Users to represent Business Object Models in their own proprietary languages. Some work has been done in the last years to bridge the gap between the ontologies and the Business Rules. A pragmatic approach consist in projecting ontologies into the Object Models used by the BRMS, to ease the use of ontologies by the Business Users. The main issue with this approach is that the expressive power of the targeted Object Model is not enough to cope with the content of the ontology. Hence, the translation looses some of the information contained in the ontology, such as axioms. 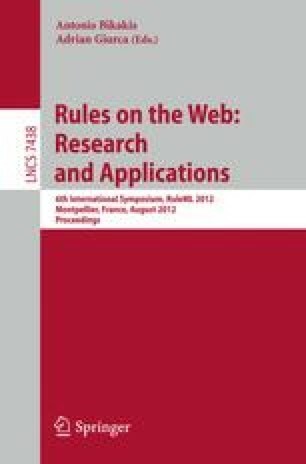 The aim of this paper, is to go a step further using this approach by translating some of the axioms defined in an OWL ontology into Business Rules. This translation brings at least two benefits: (i) it allow the Business Users to understand better the content of the Ontology by having some of its axioms in the rule language they are used to. (ii) at the run-time level, the translated axioms will be handled by the rule engine. We explain the basic mechanism of this translation and detail its implementation in the JRules BRMS system.